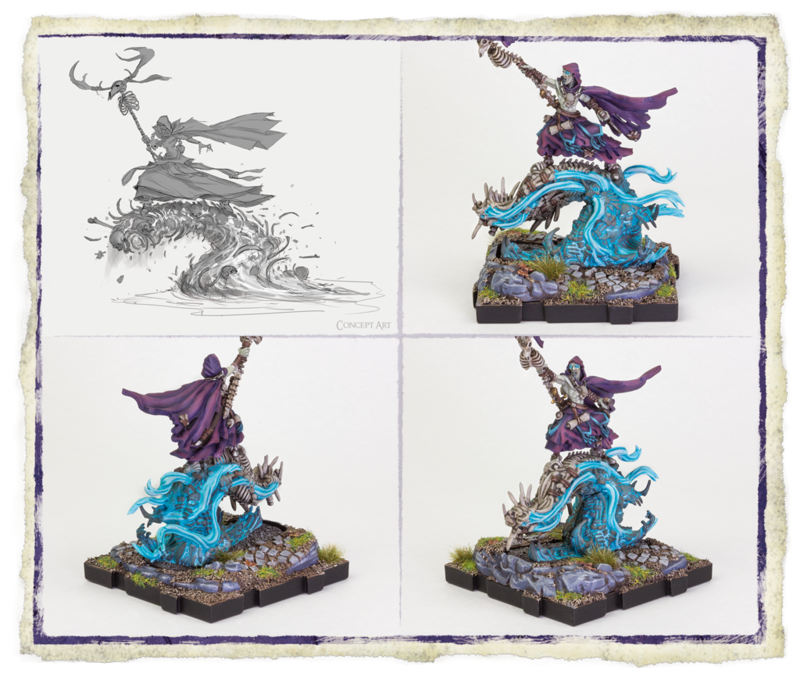 Battles continue to rage across the ancient land of Terrinoth, as the Daqan Lords and Waiqar’s Undead Legion expand their armies, new powerful heroes join both sides. The fires of war rain upon both factions and new reinforcements are vital to victory. 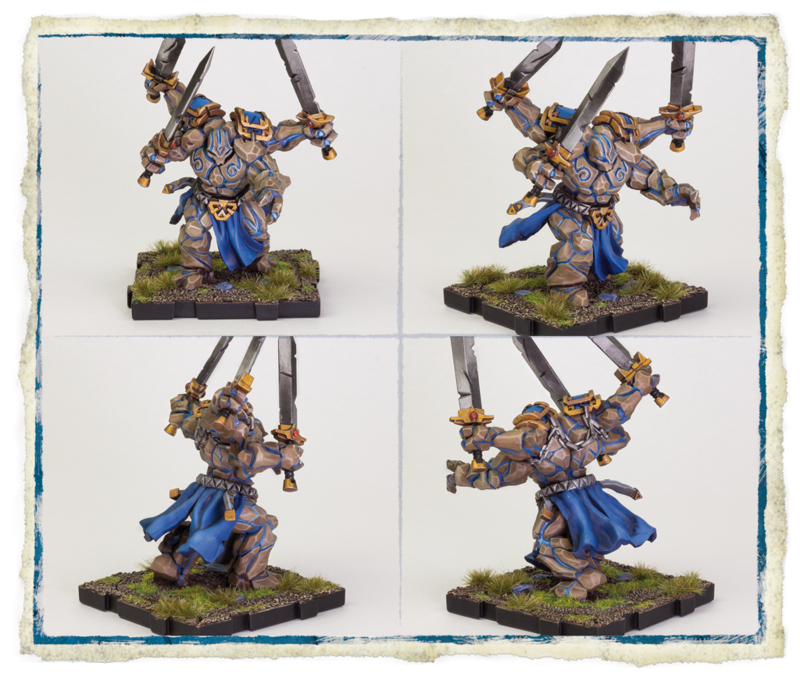 Each expansion offers a unique way to continue to grow your Runewars Miniatures Game army. 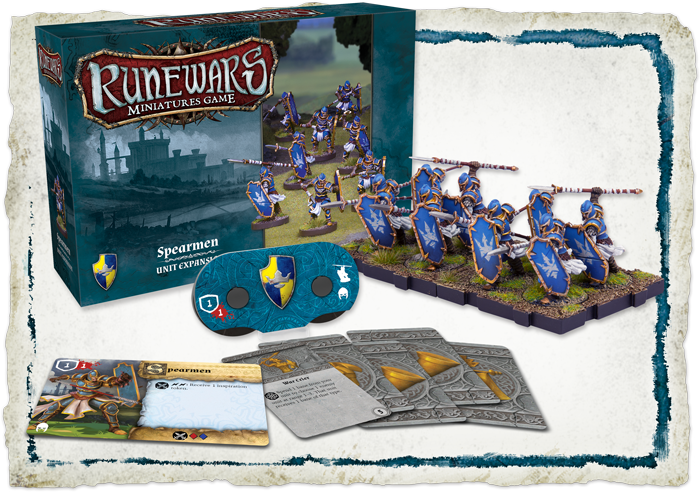 The Spearmen Unit Expansion and the Reanimates Unit Expansion offer identical sculpts to those found in the Runewars Core Set, but offer new upgrade cards and enough miniatures to field another version of each unit in your army. 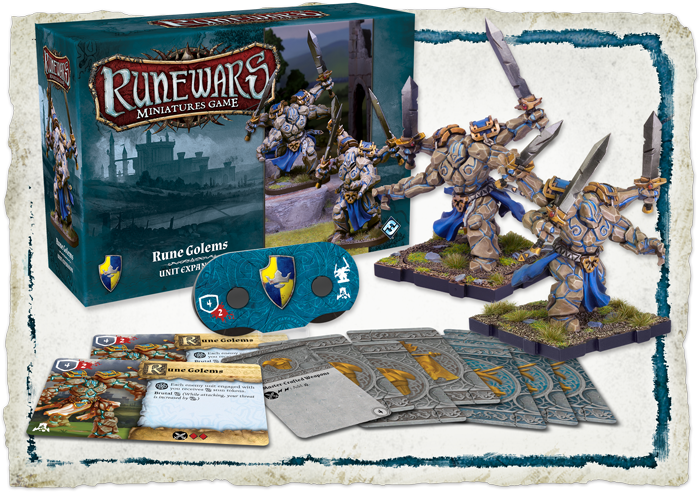 The Carrion Lancers Unit Expansion and Rune Golems Unit Expansion offer two sculpts each, one identical sculpt to the version found in the Core Set and one new sculpt, as well as additional upgrade cards. 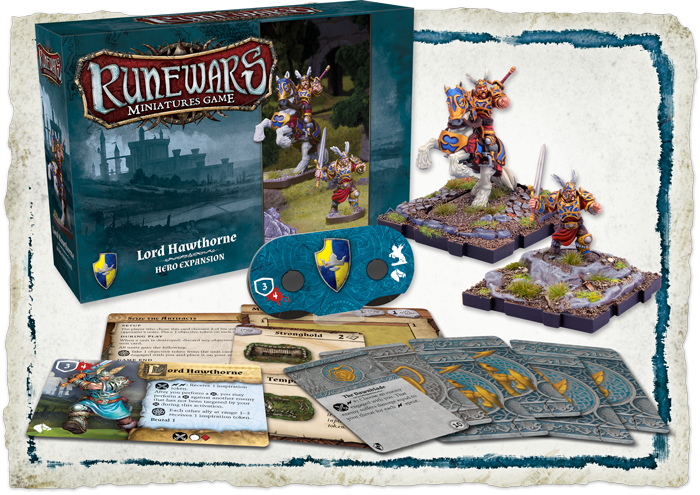 Finally, the Lord Hawthorne Hero Expansion and the Ankaur Maro Hero Expansion introduce two brand new heroes to the world of the Runewars Miniature Game, each with their own unique upgrades and sculpts. As a young man, Lord Hawthorne’s home of Seragart was beset by a horde of barbarians led by a mysterious warlord wielding foul sorcery. As a descendent of Sir Rodric the Strong, Hawthorne was not one to sit idly by. Though badly outnumbered, Hawthorne charged out of the gates with the city’s remaining troops, taking the barbarians by surprise, and uncovering the malicious power behind the attacks: the renegade sorcerer Ankaur Maro. Though the defenders of the city were eventually able to break the siege, Maro managed to escape. 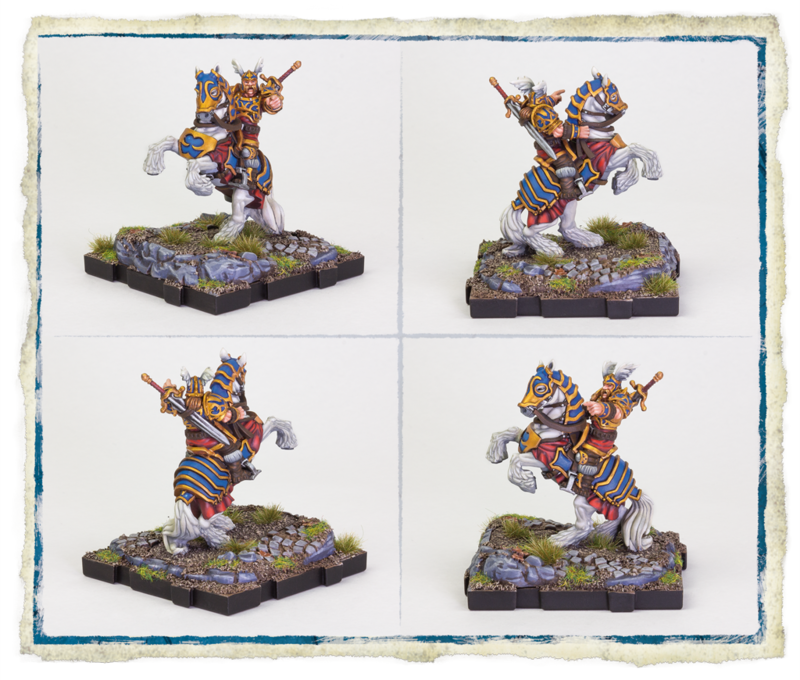 The Lord Hawthorne Hero Expansion includes two different figures for Lord Hawthorne to add to your Daqan army, a mounted and unmounted version, as well as six new upgrade cards, four of which will improve any army and two that are exclusive to Lord Hawthorne. We'll explore the finer details of Lord Hawthorne in a future preview. Few names inspire fear in the citizens of Terrinoth like Ankaur Maro. As a young wizard studying at the Universities of Greyhaven, Maro quickly became known for his great skill and even greater ambition. This drive and disregard for boundaries in pursuit of power became his undoing though, and Ankaur Maro was expelled from Greyhaven a disgrace. Not one to be deterred, Maro soon found himself in the inner circle of dark sorcerers, where he learned the secrets of flesh and blood and bone and death. Now, Maro has found a new home in the service of Waiqar the Undying, his powerful dark magic a beacon of strength for the undying legion. The Ankaur Maro Hero Expansion comes with two Ankaur Maro figures for Waiqar’s forces in the form of cavalry and infantry versions, as well as six upgrade cards, four for use with any army and two exclusively for use with Ankaur Maro. We'll explore Ankaur Maro more in a future preview. Seek ultimate power, raise the dead, and overwhelm your opponent with mystic arts with the Ankaur Maro Hero Expansion. Deep within the ancient fortresses of Terrinoth stand ancient stone guardians, ever vigilant. These monoliths of war are only ever awakened when the need is dire, an only a few Lords and Wizards know the secrets that can imbue the golems with life. The strength and ferocity of these golems knows no equal, scything their massive blades through infantry and cavalry with ease. Rune Golems will stop at nothing to destroy the enemies of the Daqan, only to return to their hidden slumber until called upon again. 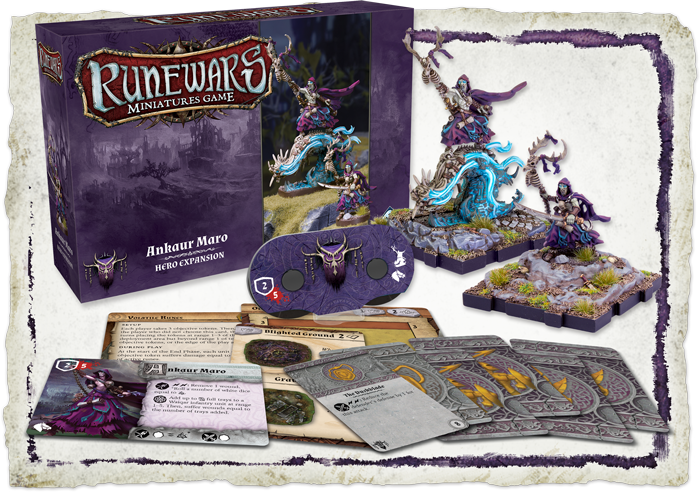 The Rune Golems Unit expansion features two Rune Golem Plastic Figures, one new sculpt and one identical to the Rune Golem found in the Core set, as well as eight upgrade cards to help you build your army anyway you choose. Look for a future preview detailing the damage these Rune Golems will do to your foes. Crush the enemies of Daqan beneath your feet with the Rune Golems Unit Expansion. 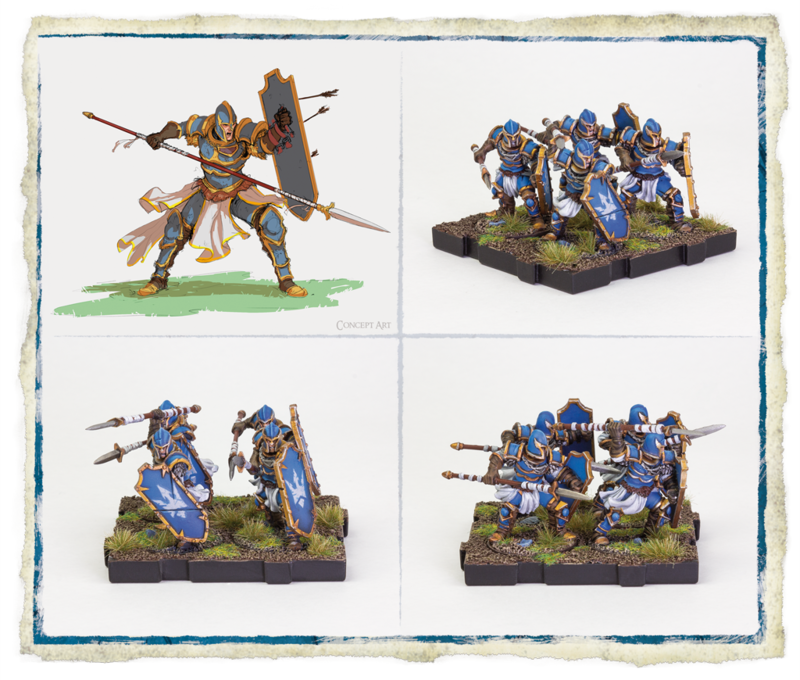 The Spearmen Unit Expansion comes with eight Spearmen plastic figures and two plastic infantry movement trays to expand your Daqan army either through improving an already existing infantry unit or forming another. Five additional upgrade cards for any army will give you the tools you need to push back any force. Look for more information on the Spearmen in an upcoming preview. Make the enemies of Daqan fear its soldiers with the Spearmen Unit Expansion. Though each Reanimate is but a fraction of the being they were when they followed Waiqar in life, the legion of skeletal warriors still strike fear into the hearts of those that would stand against them. An unquenchable spite and unbreakable loyalty to the dread Waiqar the Undying drive the legion forward to destroy anything in their path. 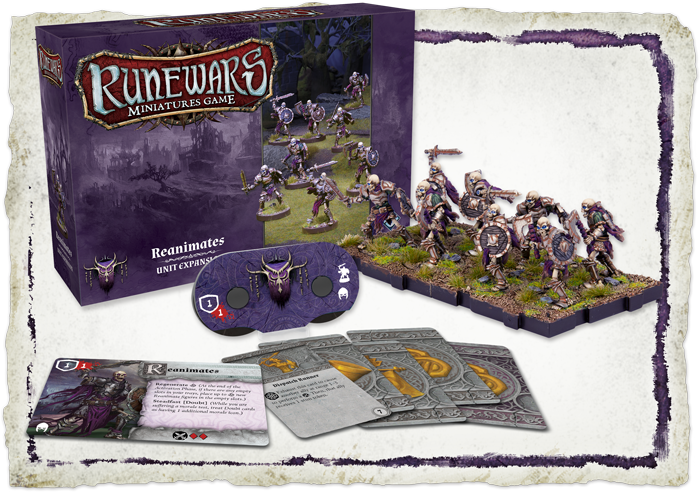 Expand your ranks of the undead with the Reanimates Unit Expansion. Featuring eight reanimate plastic figures in four different sculpts, the expansion contains everything you need to add a Reanimates infantry unit to your own army. Look for a future preview on the other components featured in the expansion. 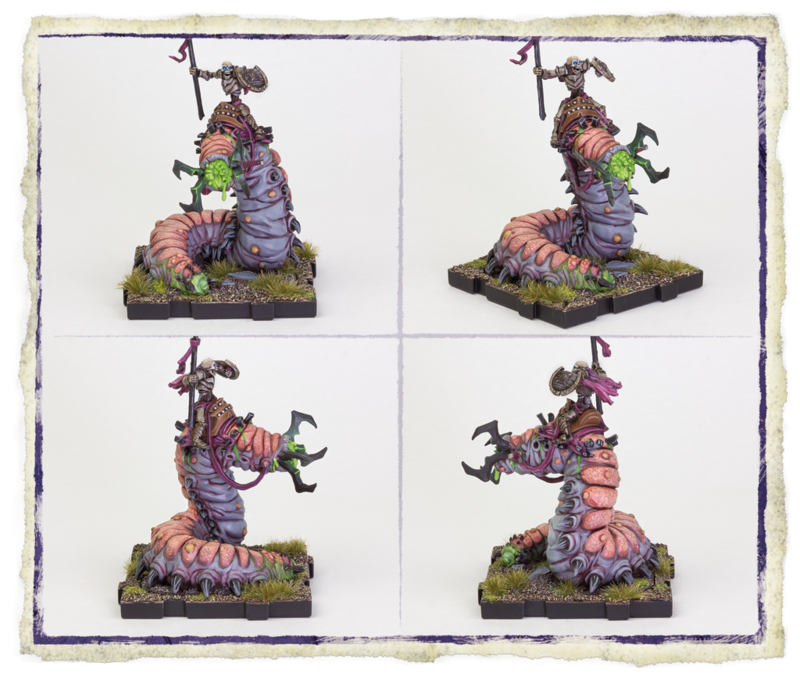 The massive Carrion Worms that follow the armies of Waiqar the Undying are not easily tamed, but always prove to be valuable assets for the Carrion Worm Masters on the field of battle. Carrion Worms are swift for their size and inspire fear in the heartiest of Waiqar’s enemies, spewing noxious bile and laying waste to their foes. 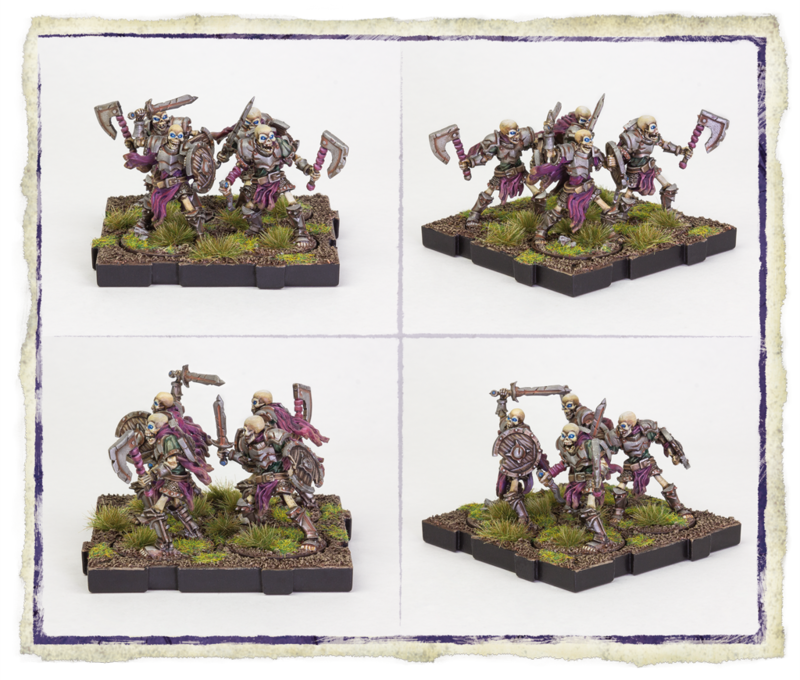 The Carrion Lancers Unit Expansion features two Carrion Lancer Plastic Figures, one new and one identical to the Core Set, to grow your legions of undead. The expansion also features eight new upgrade cards to improve your armies and crush your enemies underfoot. Look for a future preview for more information on the Carrion Lancers. 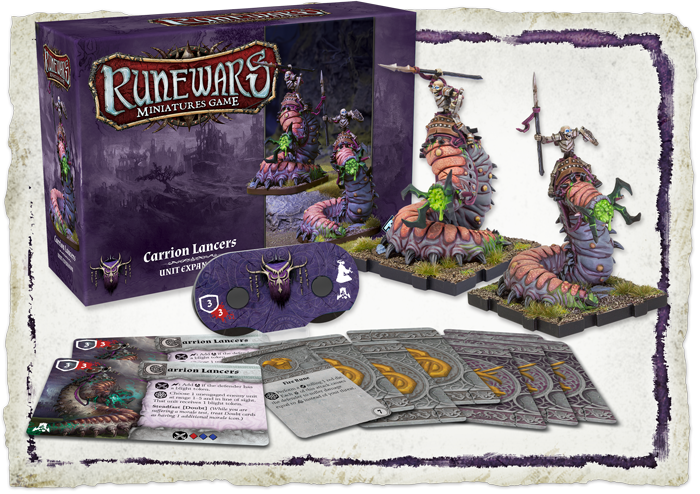 Strike fear into your opponent's hearts with the deadly Carrion Worms Unit Expansion. Whether you side with the loyal legions of the Daqan Lords or the relentless army of Waiqar’s Legion, you’re sure to find plenty of ways to expand your army in the Runewars: Miniatures Game with these upcoming six expansions releasing in the second quarter of 2017.